Visited to see the mighty U's narrowly lose 4-0! Lovely pub, great range of ales with a discount for CAMRA members, friendly helpful bar staff, decent pub food, and even better the great man himself came out to greet us and we had our photo taken with him. A short walk from Highbury stadium is this huge pub that is also the home to Syd Little's restaurant, unfortunately I didn’t see or meet Syd on this visit! I came here straight after the match so was sat with a pint by 5.05pm. I only went into the bar on the right where there is raised seating, a dart board, pool table, television and the bar with it’s vast amount of pumps, I counted at least 13 but there might have been more. A wide range of breweries and ales , I opted for a pint of Thornbridge Lord Marples @ 4.0%. Decent value at £3.00 but even better with 20% off for camra members. Minimal amount of pictures on the walls but there is a trophy cabinet displaying various trophies for the pub’s Darts team, who seem quite successful. 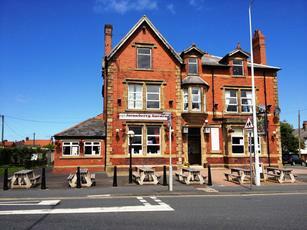 This is very much a community pub with the emphasis on good ales and friendly service. A proper traditional pub close to the football ground and tram stop as well as appearing in the GBG. Excellent selection of beers and lagers. Has wide range of entertainment which draws carried types of audience. Food in the restaurant is great value and Syd Little is always affable and helpful. Large pub with a good selection of ales. Has a kind of old style lounge and bar layout with the bar side being to the right as you go in and housing a pool table. The best ale pub in Fleetwood by some margin. And... a pint of ale was £2.90 with CAMRA card holders getting a discount.